The North West Parents and Friends Association are a voluntary Sligo and Leitrim based community association, which is dedicated to the support of facilities and communities, working towards the fulfillment, needs and rights of people with intellectual disabilities and special needs, to achieve for each individual the greatest possible level of health and social gain, bearing in mind at all times, the personal dignity of each individual. The services provided by North West Parents and Friends Association are aimed at those from the greater Sligo and Leitrim areas. Our Sligo centres are located in Strandhill Road, Ballytivnan, Cleveragh Industrial Estate, Cleveragh Drive, Rathedmond. 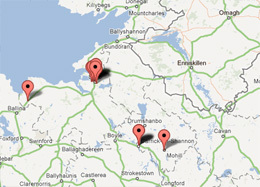 Our Leitrim centres are located in Carrick-On-Shannon and Drumbshambo.